Penguin & Bear provides accommodation in Prince Edward Island. Welcome to Red Sticks, a place where you will find your island inspiration. Here you will find upcoming events, articles on the local lands and the people that make PEI so magical. As the landscape gets greener by the day, hints of the warmer months are beginning to sprout. With the time for planting up vegetable gardens just around the corner, we have put together a basic guide on how to create your own patch of produce. Choose a spot that has plenty of direct sunlight. Ideally 6 - 8 hours per day is perfect. Watering is also a consideration; so keep in mind that you will want a place that your hose can easily reach. Start with a list of your favourite vegetables to see if they are suitable. When selecting your plants, it’s also worth considering the amount each plant can produce. Some good plants for beginners are Mint (though it can take over), Swiss Chard, Zucchini, Lettuce, Tomato, Radishes, Squash, Cucumber, Onion and Parsley. Draw a rough design while consulting seed packets for spacing, spread and height information. It’s best to place the taller plants along the back so they don't shade shorties. Whether you are starting from seed or fast tracking your garden with seedlings, all the information you will need in terms of growing conditions should be included on the packaging. When drawing out your garden keep some paths clear so that you can tend to your garden without treading on your plants. You may also want to create an edge for your garden; this could be created with annual flowers that can double up for use in your home too. Working with soggy soil compacts it, making it harder for plants to grow. A useful hint is to give it a squeeze in your hand; if it falls apart when you open your fingers, it's dry enough to get digging. Measure and mark out the plot with stakes and string, before you lift of any grass. 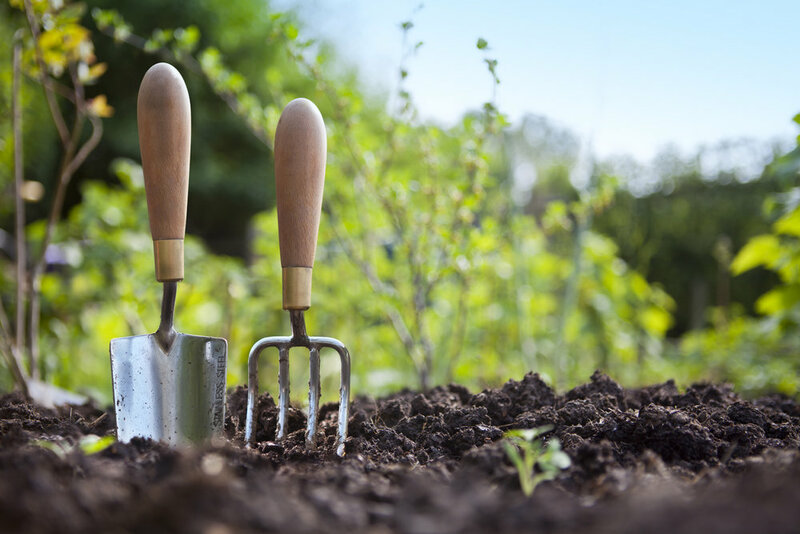 Using a garden fork and shovel, turn the soil to a depth of at least 30 centimetres. Making sure that the soil is free of grass, weeds and roots. Cover with about three centimetres of composted manure and fertiliser before working it in and raking the surface. You can start seeded plants in advance by following the instructions listed on the packet and keeping them in a sunny window. Click here for some tips from The Old Farmers Almanac. Following your plan, plant your seedlings with space for them to grow. Stake peas, beans and tomatoes; use branches, a fence, tomato cages, even an old hockey stick would do the trick. Give your garden a good water to settle your plants into their new home. Enjoy the fruits (and vegetables) of your labour!